During Ocean Drilling Program Leg 172, we recovered 5.8 km of sediment from eleven sites: ten of them along a depth transect down the Carolina Slope and Blake Bahama Outer Ridge (1300 to 4800 m water depths) and one on the Bermuda Rise (4600 m). 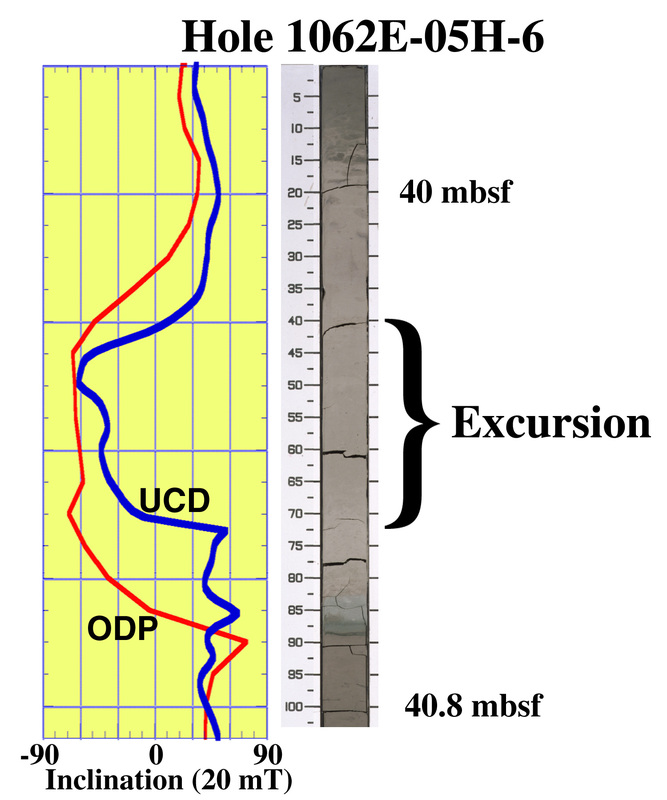 Sedimentation rates at the 10 deepest sites averaged between 10 and 30 cm/k.y. over the past 1.2 m.y. Three to eight holes were cored at each site to ensure recovery of complete stratigraphic sections. The redundant sampling of these thick Pleistocene sections proved to be extremely valuable for correlating and verifying features in the geomagnetic and rock-magnetic records. For example, in the secular variation record for the Brunhes, direction and intensity changes that span intervals as short as 100 years or longer than 100 k.y. can be correlated between holes at a site and between sites as far as 1600 km apart. Furthermore, the magnetic susceptibility at nearly all sites shows a clear correlation with the low-latitude marine oxygen isotope record, indicating that the rock magnetic signature of the Leg 172 cores will yield information on the paleoenvironment and paleoclimate of the region as well as be useful as a dating tool. Besides establishing a composite record of secular variation that is more than 1 m.y. longer than existing records, the Leg 172 results present an opportunity to examine basic properties of the geomagnetic field, such as directional dispersion over time, time variation of the non-dipole field, and relationships between paleointensity, directional changes, and climatic changes. on a split-core section on board the JOIDES Resolution.